Originally from Hungary, Esther Demeny moved to England in 1947 where she studied art at the Polytechnic School of Art in London. While in England, Mrs. Demeny worked as, what we would today call an art therapist, teaching painting to patients. Mrs. Demeny met her husband in England and they eventually made the move to Canada. The couple moved around living in cities and towns in Ontario and Quebec before settling down in 1957. As an artist, Esther Demeny went under the pseudonym of 'David' and has had several solo shows, including one at the Woodside Branch of the Oakville Public Library in 1964. Demeny liked to experiment with various mediums including conte, pastels, and oils. For Demeny, painting was a form of communication. 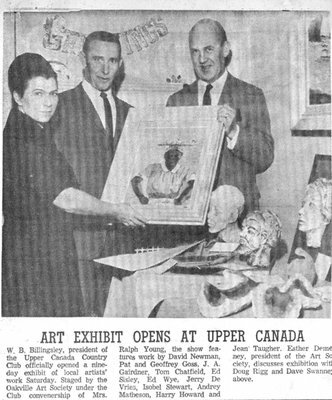 With the Society in good hands, Demeny took over as curator for the Oakville Art Gallery until 1976. At the gallery, Demeny actively promoted Canadian talent as well as Native and Inuit artists, for whom she had a passion for. 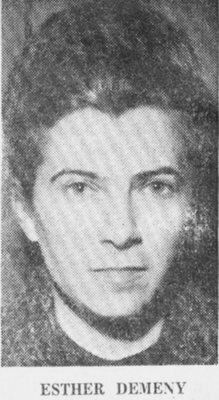 Mrs. Esther "David" Demeny passed away in 2001. Appleby College, Bronte Historical Society, Trafalgar Township Historical Society and Private Collections.